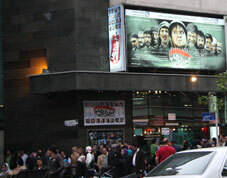 Two groups are influential in public screening of Iranian films: owners of movie theaters and Screening Guild Council. When Ministry of Culture and Islamic Guidance issues screening permits for films (which have no legal or censorship problems) theater owners sign contracts with their producers to screen their films according to a schedule. Screening Guild Council determines regulations as well as the schedule. Its members are producers, directors and theater owners. There are six groups of theaters in Tehran and each group includes a number of movie theaters every one of which is told to screen a certain film and it is not customary for movie theaters to screen every film that they want. Duration of screening also depends on box office returns. If a film sells lower than the standards, it may be taken off the screen in a matter of two weeks. During this year’s Fajr Festival, everybody could guess that The Expelled 2, like its prequel, The Expelled, would be favorite film of the audience. Massoud Dehnamaki, who has directed both films, has worked with a more professional crew in the second episode of The Expelled. The Expelled 2 cannot be a favorite for the jury or critics, and it was not admitted to the competition section, but people’s enthusiasm to see it showed that it would be also a hit in public screening. Therefore, it was predictable that The Expelled 2 will sell better than other films, but the surprising point was its sale, which amounted to 6 million dollars in a single month. Box office returns for The Expelled 2 was about 10 times the second-runner, Superstar. Although when schools and offices were opened after new year holidays, daily proceeds of the film fell by about 20 percent, it was evident that its sale record will not be broken for years to come. Owners of movie theaters reported that most theaters screening The Expelled 2 were loaded with viewers with no empty seats and even extra showtimes were considered for it and sometimes people waited until midnight to watch it. Box office return for the last year’s bestseller, Tambourine, has been thus far less than one-fourth of The Expelled 2. Screening Guild Council has announced that The Expelled 2 will be screened for another month and in view of people’s enthusiasm, its final sale figure is expected to be much higher than the current figure. Newspapers, news agencies and websites have enumerated many reasons behind high sales of The Expelled 2. They have noted that joking with important issues like Iran-Iraq war and values governing the Islamic society can turn a simple and not-so-attractive comedy like The Expelled 2 into a blockbuster. Other groups could not tolerate joking with war and protested to the film which ironically added to people’s interest in it. Critics have noted that The expelled 2 is better than its prequel, but still lacks in artistic values. In reaction, Dehnamaki took a sharp position and said critics’ remarks were rooted in their aversion for him. Anyway, two months after screening The Expelled 2 began, it has still been in the news and now, Massoud Dehnamaki, a zealous young man who used to attack political gatherings under the former president, Mohammad Khatami, and warned them against undermining revolutionary values, has emerged as the Iranian cinema’s most expensive director through his satirical films on war.